We're getting ready to fight for libraries in 2019 and we need your support to do it. Join us today! This page uses Paypal but You can also make a contribution via ActBlue here. In the last five years we have supported dozens of library campaigns, we have fought against bad legislation against libraries in Nebraska, Michigan, and Kentucky, we have pushed back as the AFP spent tens of thousands to keep a library from being built, and we have fought against school library closures across the country. With support from people like you we have won many of these fights and in fact, for every dollar we have spent on a campaign we have returned over $1,600 in funding to libraries totaling over 300 million dollars so far. You can read our latest 2017 annual report here. EveryLibrary is a 501(c)4 organization that fights for libraries whenever and wherever they are threatened. 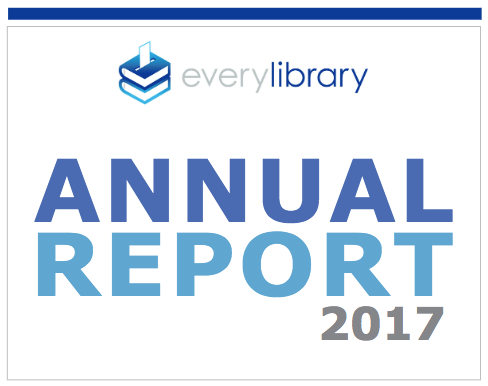 You can read about our work in our Annual Report or visit our full website at EveryLibrary.org Your donations help us to take political action on behalf public, school, and academic libraries. That's because all of our work with libraries is pro-bono to the library and made entirely possible by your contributions. To date, we have helped libraries win over 300 million dollars in funding through voter and political action and every week we put over 15 million ads about the importance of libraries in front of voters and the American public to encourage them to support and take action for their local libraries. Our research team collects data and conducts much needed political research to help us find new ways to reach the public and activate them to support libraries. Librarians all over the country are counting on you to support this important work! Who's donating: Aren Ginsberg from University City, MO donated. Thank you!